This page includes a map of the main parking lot, a map showing other access points, and a trail map. Since 2013, Friends of Herrontown Woods has cleared and cared for the trails and provides brochures with trail maps at the main parking lot kiosk. 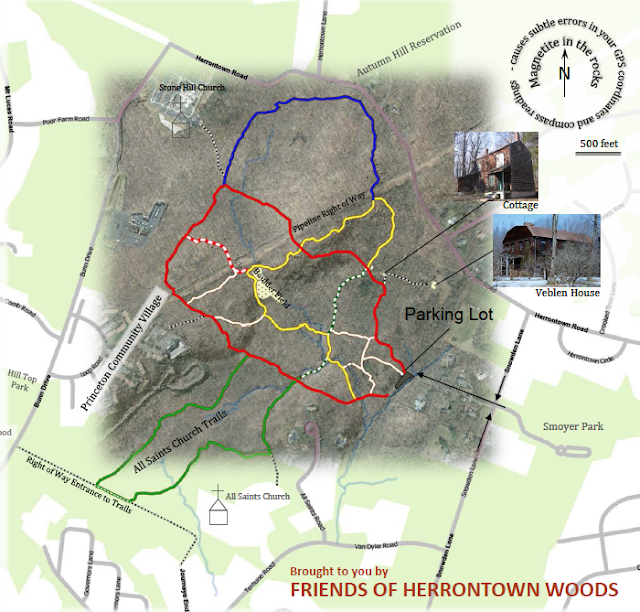 In addition to the main parking lot off of Snowden Lane, Herrontown Woods can also be accessed at the locations below. 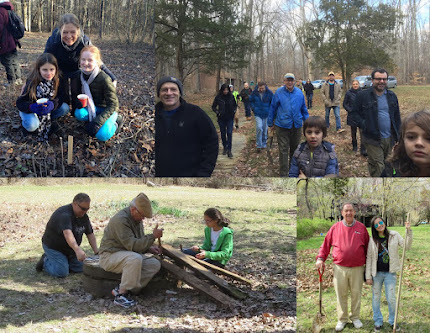 After clearing the long-overgrown trails in 2013, the Friends of Herrontown Woods accomplished another goal in 2016, simplifying the color coding for trails. As of September, we now have a fully marked red trail that begins and ends at the main parking lot, and a yellow inner loop that branches off the red trail and features lovely views of the stream, boulder field, and historic quarry sites. The blue trail is now limited to the north side of the pipeline right of way. For those winter and spring seasons when the soil is saturated with water (good for the watershed, not so great for hiking), a red/white trail now provides a way to bypass the wettest parts of the red trail. A green/white trail serves as link from the All-Saints tract to Autumn Hill Reservation. You may also find a couple small connector trails of limited use have been closed off. The map below illustrates the changes. We aim for clarity without becoming too intrusive with signage. Markers vary in height, so when you reach an intersection, give a good look around to figure out which way to go next. Enjoy the trails, and contact us with any feedback.